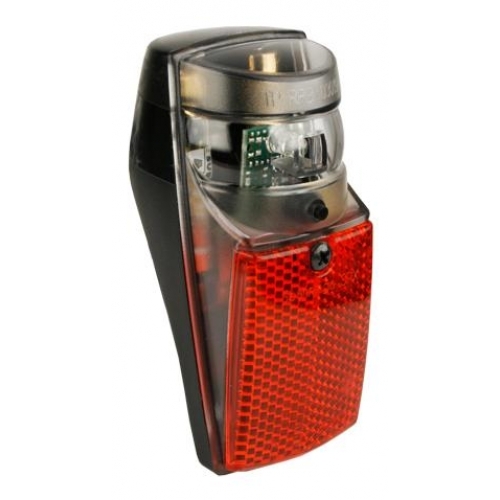 Fitted as standard on many Dutch bicycles due to its robustness, the Spanninga SPX Battery rear light mounts permanently on your rear mudguard and contains a single bright LED with a plastic lens to improve the visibility of the light. 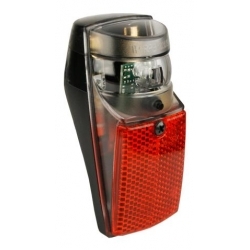 This lamp operates from two AAA cells and uses a small push button electronic on-off switch. This is superior to a mechanical bent piece of copper type switch which can become unreliable. Position the light so that the LED faces directly towards the rear (not upwards at all because the idea is to be maximally visible to people at a distance). Fitting the light requires two holes separated by 19 mm in your mudguard. One hole is filled by the bolt which is part of the light itself and the other by a plastic knob which prevents the light from rotating on your mudguard. Usually the batteries are included. However, we have multiple suppliers and this can't be guaranteed.